Ganache is a French term referring to a smooth mixture of chopped chocolate and heavy cream, used as a base to make chocolates or as a glaze, sauce or icing used as filling for pastries, to make truffles, to glaze cakes and many more uses. 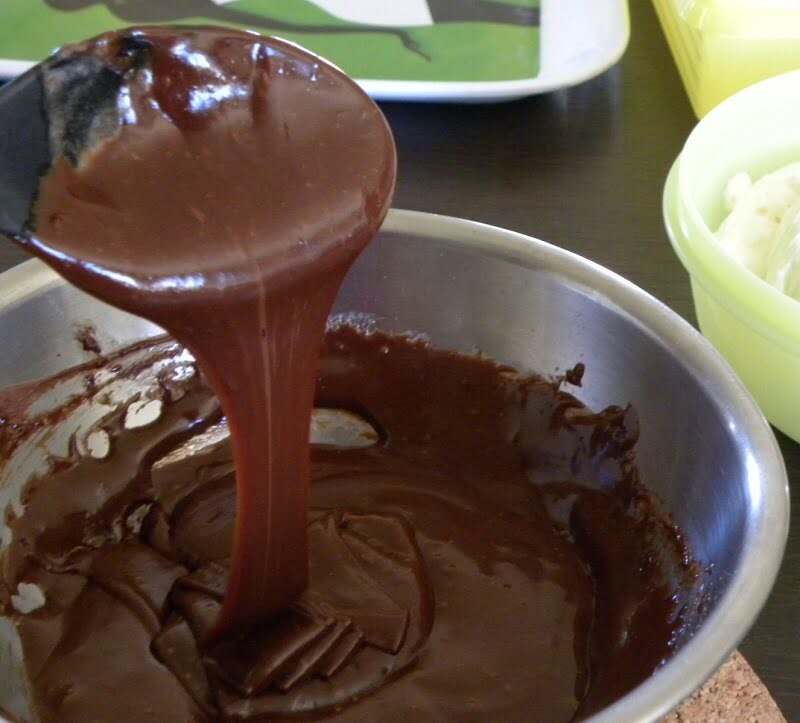 Before making a ganache, you will need a good quality chocolate (dark or white) to melt. Chocolates with around 70% cocoa content will make your desserts much tastier. Using an electric chocolatière (electric chocolate melting pot). Follow the instructions of the manufacturer. Using the microwave. This is the easiest way, however, you must be careful to use a microwave safe container. Break chocolate in smaller pieces and put your microwave to low heat. Melt it for 1 – 2 minutes, stir with spoon and if it has not melted completely, add 1 minute more and repeat. Add remaining ingredients and mix. For white chocolate, start with 1 minute and continue with 30 seconds. Another way is to heat the heavy cream on the stove top and then remove it from the heat, add the chocolate and other ingredients and mix until it melts. Finally, the method I use is to melt the chocolate in a double boiler also called bain Marie or water bath. If you don’t have a double boiler use a saucepan and a metallic bowl which fits on top of the pot. Add about 1 – 2 cm water in the pot and add the bowl with the chocolate on top. Bring to boil, reduce heat and stir chocolate until it melts. Add the remaining ingredients, as per recipe and mix. The less heavy cream you add, the result will be a harder ganache when it cools. So if you want a soft ganache it’s advisable to add equal amount of chocolate and heavy cream. Increase or decrease, depending on the result you want to achieve. For a thick glaze, use one part chocolate and one part heavy cream, i.e. 100 grams chocolate and 100 grams heavy cream. To coat chocolate truffles, use two parts chocolate and one part cream, i.e. 100 grams chocolate and 50 grams heavy cream. For a soft glaze, similar to chocolate sauce, one part chocolate and two parts cream i.e. 50 grams chocolate and 100 grams heavy cream. 225 grams good quality chocolate, sweet, semi-sweet, bitter, couverture, white chocolate, etc. 1 tablespoon liqueur of your choice, amaretto, grand marnier, baileys, etc. (optional) to match the taste of your dessert. Prepare a water bath: Put about 2 – 3 cm water in a small pot and put a metallic bowl, which fits in the pot, on top. Chop the chocolate into smaller pieces or use chocolate drops and stir with a metal spoon until melted. Add the heavy cream gradually and mix until incorporated. Finally add any of the optional ingredients and mix until smooth. Set aside to cool, stirring occasionally, until the ganache is thick and spreadable. Heat the heavy cream over medium heat. When the cream has come to a boil, pour over the chopped chocolate, and whisk until smooth. Stir in the remaining ingredients, if desired. Note: Apart from the chocolate of your choice the heavy cream may be substituted with low fat cream or 0% fat milk, to make it with less calories. For a vegan ganache you can use dairy-free chocolate and substitute heavy cream with vegan cream, coconut cream or almond milk. Apart from the chocolate of your choice the heavy cream may be substituted with low fat cream or 0% fat milk, to make it with less calories. Can I make a Vegan Chocolate Ganache? In the vegan option, use vegan chocolate and substitute heavy cream with coconut cream or almond milk. Honey is not necessary. For the vegan ganache with coconut cream, I found out that it is better to add more chocolate than cream i.e. 120 grams chocolate and 80 grams coconut cream. To sweeten your ganache, add icing sugar to your taste. For the vegan chocolate tahini ganache, use 1/4 cup tahini for 200 grams chocolate. Melt 200 grams dark chocolate over a double bath and mix in the tahini. To sweeten it, add some pomegranate syrup or other syrup of your choice and mix until it becomes spreadable. You can also add maple syrup, grape molasses, carob syrup etc. Instead of syrup, you can add some icing sugar. If it becomes too hard, you can thin it up with some water, orange juice, liqueur etc. A very easy cake made in no time! An easy, delicious and healthy vegan chocolate cake made in no time. One of the easiest and delicious, vegan glazes to add on top of your vegan cakes and other creations! Add the tahini and mix. Add syrup or other sweetener as well as salt and pepper and mix. .
Before using the tahini, mix it well as the oil usually sits on top. The amount given is enough to glaze a cake baked in a 26 - 28 cm baking pan.